Movie reviews, big and small, for anything that has passed before my eyes. Clive Barker hasn't always had the best of luck in adapting his works for the medium of film. Hellraiser and Candyman were great successes, but it's only now, many years later, that Nightbreed is being seen in a cut closer to his vision, and Lord Of Illusions is a film that perhaps should have been left a while, given time for Barker to develop a better budget and make use of some better CGI. It also may have worked better with a better cast. 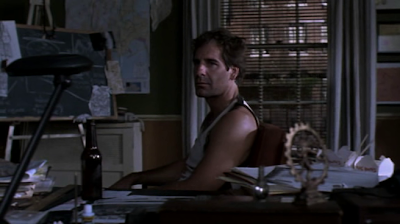 Scott Bakula takes the lead role, playing detective Harry D'Amour, a man who is no stranger to the occult, as the newspapers keep reminding the public in any articles about him. His latest case brings him in contact with a renowned illusionist (Philip Swann, played by Kevin J. O'Connor), his lovely wife (Famke Janssen) and a number of members of a dangerous cult who are awaiting the return of their leader (Daniel von Bargen). He also meets a number of magicians and has to start differentiating between what is magic and what is illusion, and which, if any, can do him harm. Written and directed by Barker, from his own work - "The Last Illusion" - there is a lot to like in Lord Of Illusions, but almost just as much to dislike. As previously mentioned, the CGI is a particular problem, at times. That's a great shame because some of the practical effects are great, and a film so concerned with magic should have kept things as practical as possible. The same mistake was made in the much more recent Now You See Me. Bakula tries his best in the lead role, but he's just never been a leading man, in my opinion, outwith TV. This is a great role, an archetypal private eye who gets out of his depth, but he still struggles. Kevin J. O'Connor does a bit better as Philip Swann, but he's another actor who I've never been that impressed by. Thankfully, Janssen does her best with a pretty weak role, and Daniel von Bargen is as great as he usually is. The movie does well when Barker fills the screen with small, disquieting details, as he does in the opening scenes (a prologue that shows the apparent end of von Bargen's cult), and it has one or two good ideas that deserved better treatment, but this ends up being quite a disappointment. The detective story strand isn't all that entertaining, the horror isn't scary and viewers are just left with a bunch of separate, flat moments sandwiched in between good 5-10 minute sequences at either end. Horror 101 at Amazon.com (with a bit by me in it). Yep, I also now do a podcast. I know, I know . . .
"But if I don't keep count, I don't know how many souls to pray for"
"Follow me, or perish, sweater monkeys"
"You are all my children now"
"Who am I? You sure you want to know?" "CHEROKEE CREEK" new indie film making a name for itself in the VOD world!! The Funhouse Closes It's Doors. "Didn't notice it was a popularity contest"
Alien Covenant is BAD and Ridley Scott should feel BAD. Anneliese: The Exorcist Tapes (2010) AKA Paranormal Entity 3.